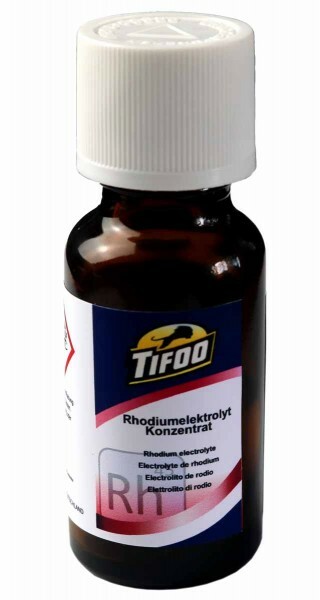 Product information "Rhodium Electrolyte Concentrate"
black rhodium layers possible with our "black rhodium additive"
In the jewellery industry, rhodium is used e.g. for tarnish- and oxidatino protection of silver. Via electroplating, the plating solution will be transformed into a rhodium layer on your object. On nickel, gold, silver, copper, brass and other metals you can directly create rhodium layers. By mixing this rhodium plating concentrate with our black rhodium additive, you can deposit anthracite rhodium layers with our GalvanoPen (pen plating). Related links to "Rhodium Electrolyte Concentrate"
Customer evaluation for "Rhodium Electrolyte Concentrate"